Most people don’t know that the timing on their irrigation system should be adjusted at least four times per year to compensate for the temperature and seasonal rainfall. Unique Companies can do it for you! By allowing Unique to do some of these simple adjustments on our end you don’t have to remember a thing and can save 30 to 50% water per year! All you need is our new Hydrawise controller and a Wi-Fi connection at your home! 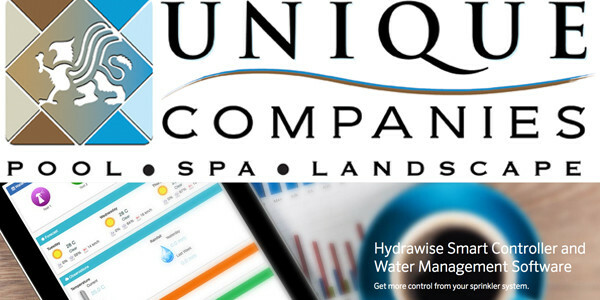 Our new controllers are all internet based, and can be managed & controlled by Unique to ensure proper & ideal water times. We offer replacement of old controllers with this new one, plus the first year of irrigation monitoring for $500. After that Unique can monitor your irrigation and adjust schedules and watering as needed for a $100 annual fee, or you can take over control yourself. It’s easy & free! It will pay for itself in SAVED WATER!!! GO GREEN with Unique Landscapes & WATERWISE by Hunter! Control and monitor your sprinkler system from anywhere in the world using your web browser or the Hydrawise iPhone and Android apps. Easy setup and installation with Hydrawise Ready controllers. The graphical touchscreen interface makes programming without Wi-Fi connectivity a breeze. Install and program within minutes with this controller. Irrigation programs have long confused many people. Hydrawise software makes understanding a watering schedule easy, even for a novice. It also allows for advanced scheduling to meet the needs of almost any landscape requirement.